It has been a decade since the 9/11 terrorist attacks, and much has changed in OSHA Region 2 (New York, New Jersey, Puerto Rico and the U.S. Virgin Islands). In the past, the emergency response community viewed OSHA as dealing strictly with safety and health needs in construction or general industry, but the agency’s expanded role in emergency response now is accepted, according to Region 2 Administrator Robert Kulick. As part of a post-9/11 emergency response preparedness environment, the region has conducted in-house training and drills. OSHA staff in the region also have participated in full-scale exercises with other agencies, including state police departments and the New York City and New Jersey offices of emergency management. The agency’s role in a major incident is not to act as a safety officer, but to assist the safety officer in keeping emergency responders safe, Kulick said. As he put it, OSHA is there to provide help, not problems. “We want to instill in these first responders that when they are doing these heroic acts, there are risks and we want to be there to help them be safe when they’re trying to save others,” Kulick said. 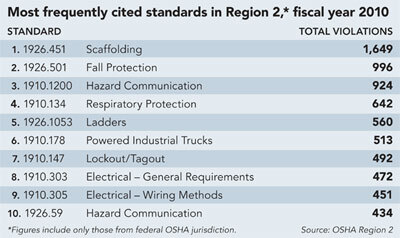 Unlike other regions, Region 2 consists solely of states and territories that have a State Plan component: New Jersey, New York and the U.S. Virgin Islands operate their own OSHA programs to enforce regulations in the public sector, while federal OSHA enforces the private sector. Puerto Rico operates an OSHA plan that enforces regulations in both public and private sectors, except for the maritime/shipyard industry, which is enforced by the federal government. When an unprecedented amount of snow fell in New York and New Jersey this winter, OSHA issued guidance to employers on hazards associated with cleanup and proper safeguards. In Region 2, the guidance was published in five languages: English, Brazilian Portuguese, Chinese, Korean and Spanish. Outreach to workers whose primary language is not English is an area in which Kulick believes Region 2 historically has led the rest of the country. Since at least the 1990s, the region has worked to increase and improve such efforts. It has hosted meetings with stakeholders, visited worksites for consultation, and participated in local safety and health or health care and wellness fairs. Following the Department of Labor’s national Latino summit last spring in Texas, Region 2 hosted a summit in New York City. The summit drew about 400 attendees, many of whom were workers. Another Latino summit is planned in South Jersey in April, and a Pan-Asian summit is in the works for May (potentially in Queens). To address occupational safety and other work-related issues of migrant farm workers, Region 2 plans to partner with agencies such as the DOL Wage and Hour Division and the Environmental Protection Agency to educate workers on their rights and where they can receive help in their community. “The basis for these summits is to make sure these immigrant workers know they have rights under the OSH Act,” Kulick said. In Region 2, OSHA has launched several Local Emphasis Programs related to amputations, construction rehabilitation and demolition, heavy construction, and health hazard targeting. Ensuring safe high-rise construction is one of the region’s bigger challenges, Kulick said. To address this, the region works with the industry, unions, and various other groups through partnerships and alliances. Some future enforcement and outreach efforts will focus on the growing “green” industry, he added. Kulick said the region is partnering with state programs to begin safety outreach efforts with a variety of industries and union groups.